Dr. Kerry Solomon, an ophthalmologist in Charleston, SC, recently donated his surgical services to help a local teen suffering from rare juvenile cataracts. Charleston, South Carolina (December, 2015) – Dr. Kerry Solomon and Physicians’ Eye Surgery Center (www.charlestoneyesurgery.com) recently waived their fees and secured donated premium lenses in order to give the gift of sight to a local teenager. The 15-year-old suffered from severe cataracts – a condition typically associated with advanced age. “Hers is a very unusual case,” said Dr. Solomon. “We don’t know for sure what caused her to develop cataracts at such a young age, but we do know that cataracts only get worse, not better.” Without surgery, Dr. Solomon said, the young woman could have expected her severely impaired vision to continue to decline, eventually leading to blindness. Most people develop cataracts, a condition characterized by a thickening and clouding of the eye’s natural lens, in their retirement years. The condition is easily corrected with cataract surgery, which replaces the cloudy lens with an artificial lens (IOL). Since standard IOLs restore vision at a set distance, most patients opt for premium IOLs, which restore a more natural range of vision. These are more expensive, and since they are considered elective, they are not covered by insurance or Medicare. While the young woman was insured, her family could not afford the out-of-pocket costs, which included the multifocal lenses and the laser component of the cataract surgery. 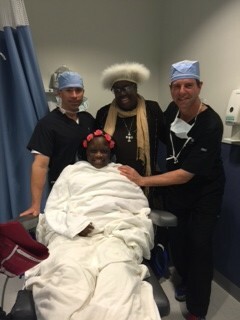 “I really wanted this young lady to experience the best, most natural vision we could give her. At such a young age, I didn’t want her to experience the stigma of wearing bifocals, which definitely would have been the case without the multifocal lenses,” Dr. Solomon said. In evaluating the young woman’s rare condition, Dr. Solomon determined that laser cataract surgery would be a safer option than traditional cataract surgery. “In her instance, the use of laser assisted cataract surgery was an advantage in removing her cataract more safely. Cost was an issue, but these fees were waived and donated due to her unusual circumstances and the genuine advantage to laser cataract surgery,” Dr. Solomon said. Prior to surgery, the young woman’s best corrected vision was 20/100 in her right eye and 20/50 in her left eye. After surgery, without correction, she has 20/20 vision in both eyes. The surgery was a coordinated effort involving the patient’s optometrist, Dr. Maria Cerra; the Physicians’ Eye Surgery Center; Abbot Medical Optics; and Dr. Solomon. If you would like to find out more about cataract surgery, LASIK, or other eye surgery procedures from Dr. Solomon, request a consultation online, or call our office at (843) 881-3937 and one of our friendly staff members will schedule an appointment for you.